DAMASCUS, Va. (AP) — An elderly driver plowed into dozens of hikers marching in a Saturday parade in a small Virginia mountain town and investigators were looking into whether he suffered a medical emergency before the accident. About 50 to 60 people suffered injuries ranging from critical to superficial, but no fatalities were reported. Three of the worst injured were flown by helicopter to area hospitals. Their conditions weren't immediately available. Another 12 to 15 victims were taken to hospitals by ambulance and the rest were treated at the scene, where some paramedics and other first-responders were participating in the parade. 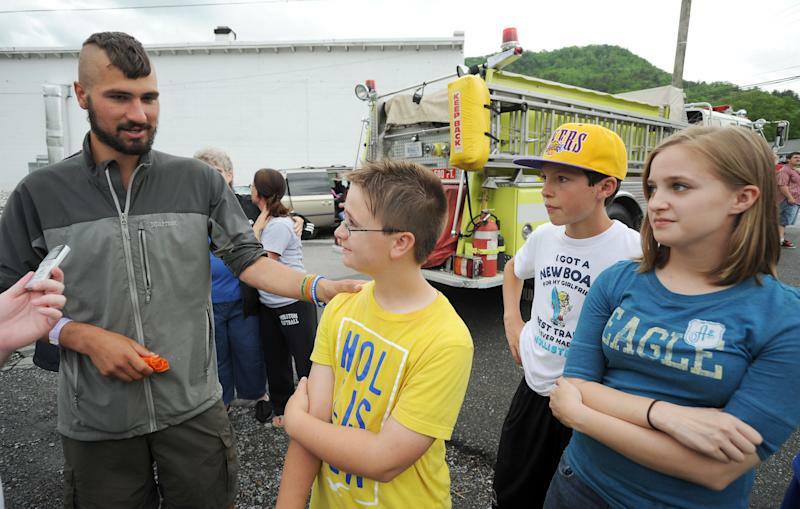 It happened around 2:10 p.m. during the Hikers Parade at the Trail Days festival, an annual celebration of the Appalachian Trail in Damascus, near the Tennessee state line about a half-hour drive east of Bristol. Damascus Police Chief Bill Nunley didn't release the driver's name or age but said he was participating in the parade and he had traversed the Appalachian Trail in the past. Multiple witnesses described him as an elderly man. Nunley said the man's 1997 Cadillac was one of the last vehicles in the parade and the driver might have suffered an unspecified medical problem when his car accelerated to about 25 mph and struck the crowd on a two-lane bridge along the town's main road. The driver was among those taken to hospitals. "It is under investigation and charges may be placed," Nunley said. Witnesses said the car had a handicapped parking sticker and it went more than 100 feet before coming to a stop. "He was hitting hikers," said Vickie Harmon, a witness from Damascus. "I saw hikers just go everywhere." Amanda Puckett, who was watching the parade with her children, ran to the car, where she and others lifted the car off those pinned underneath. "Everybody just threw our hands up on the car and we just lifted the car up," she said. Keith Neumann, a hiker from South Carolina, said he was part of the group that scrambled around the car. They pushed the car backward to free a woman trapped underneath and lifted it off the ground to make sure no one else was trapped. "There's no single heroes. We're talking about a group effort of everybody jumping in," he said. Nunley cited quick action by police, firefighters, paramedics and hikers to tend to the victims, including a volunteer firefighter who dove into the car to turn off the ignition. The firefighter, whose name wasn't released, suffered minor injuries. Mayor Jack McCrady encouraged people to attend the festival on Sunday, its final day. "In 27 years of this, we've never had anything of this magnitude, and is it our job to make sure it doesn't happen again," he said. McCrady said a donation fund was being set up to assist the injured, some of whom don't have medical insurance. "We want to make sure they don't suffer any greater loss than they already have," he said.